Havelock, NC Bojangles'® Tands, INC. Store #3 - Bojangles'® / Tands, Inc.
At the Bojangles’® in Havelock, NC we offer fast, friendly service and great food. We’re honored to be the favorite of many Havelock locals, including members of several branches of the U.S. Armed Forces. 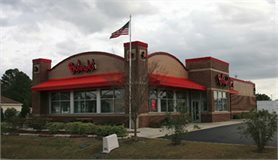 Bojangles’® is proud to serve and be a part of the Havelock, NC community around the Cherry Point Air Station. Swing by to get the delicious southern food you crave, and enjoy it with friends and family in a welcoming atmosphere. The Havelock, NC Bojangles’® offers all of the menu favorites we’re famous for: our flaky biscuits made from scratch, fried chicken dinners, southern-stye fixin’s and more! For breakfast, lunch and dinner, it’s Bo Time!